Understanding place value is critical to students' success in math. 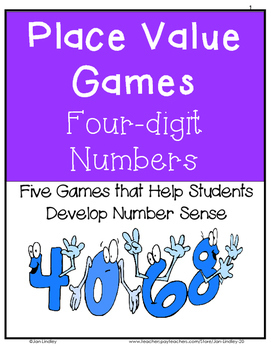 These five games reinforce basic place value and numeration skills. The games are all simple, easy to prepare, and easy to play. Students will develop and reinforce their understanding of number concepts while having fun! All that is required is copying on cardstock and laminating. One game requires sets of posicle sticks or tongue depressors. "Place Value Bingo" is played as a whole class, with the teacher drawing a card and calling out a digit with a specific value. 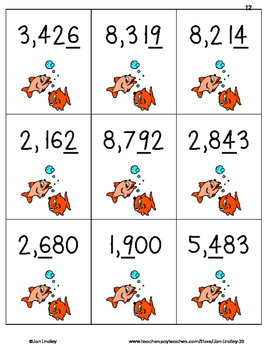 In "Place Value Go Fish", students play in small groups and form sets of numbers having digits with the same value. In "Outplace Me", students try to make the largest number, one digit at a time. 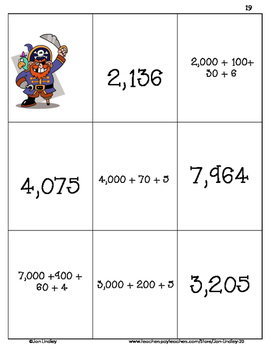 "Place Value Pirate" is played like Old Maid, with no one wanting to be left holding the pirate. And in "Place Value Concentration", students try to match cards with standard form and expanded form of a number. 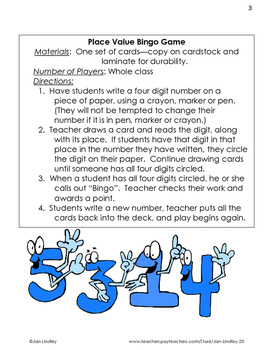 These games will add variety and fun to your place value unit! Want to be informed about new products, discounts, and freebies in my store? Find the green star near the top of this page. Click the "Follow Me" link and you'll receive emails about my store!